*OPEN HOUSE Sun March 17, 2-4pm* Beautiful single family home on a quiet crescent in Barrhaven!This spacious 4bd, 3.5 bth home is situated on a large lot near transit, schools, shopping, parks & more! The main level features a large den & full seperate dining room with french doors. The large kitchen has stainless steel appliances, granite counters with breakfast bar, & large eating area. Living room with gas fire adjoins. From the spacious 2 car garage is a large mudroom/with laundry. 2 pc bath completes this level. Up the winding staircase find a spacious landing with gleaming hardwood floors leading to a large master suite with walk in closet, a gorgeous ensuite featuring soaker tub, seperate shower & dual sinks. 3 more large bedrooms and a full bath complete this level. Head down the winding stairs to the lower level. Find newer, plush carpeting through the large rec room area that has space for a home gym. A 3rd full bath is on this floor. 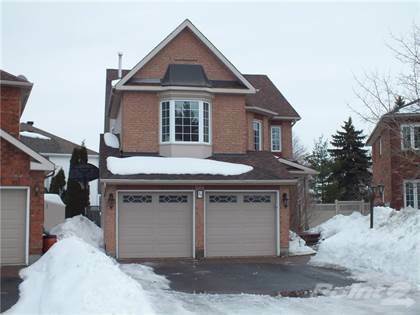 Hi, I'd like to find out more information about 28 Dewberry Crescent. Thanks so much!